Johan Mahmood Merican is currently the Director, National Budget Office of the Ministry of Finance. Prior to his appointment at the National Budget Office in 2018, Johan was the Deputy Director General (Human Capital) at the Economic Planning Unit (EPU) under the Prime Minister’s Office from 2016. Johan was Chief Executive Officer of Talent Corporation Malaysia from its inception in January 2011 until 2016. He has also served as Principal Private Secretary to the Minister in the Ministry of Finance and subsequently, in the Economic Planning Unit (EPU). 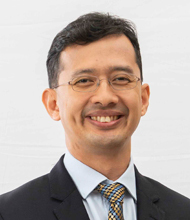 Before serving the Government, Johan worked in the private sector for nine years in corporate finance and accounting roles at MRCB, Sime Darby and PricewaterhouseCoopers.